Colouring In is the inaugural show at Transition and features new figurative painting from five recent Central St Martins MA graduates. Arguably the best bit about painting is the colouring in, that glorious time when the ideas have been mapped out and initial procedures completed. This unadulterated delight in the medium is reflected in the joyful, unfettered painting on show. Defying academic categorisation painting here is used as a playspace to explore fantasy, desire and political concerns. However its not all Wham bam thank you mam there is a kind of new quietism abroad here. It is this uniquely girly subversion that makes for thoroughly refreshing and powerful painting. 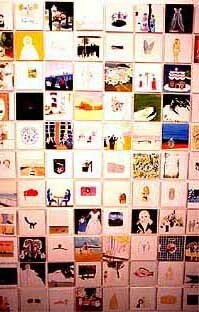 Shows paintings from her one a day series. A collection of miniature gems that convert the foibles of everyday life into a treasure trove of the eclectic. Makes paintings pure and simple. Straight from the painting class armed with a handful of snapshots this work is a reaffirmation of the joy of the medium. Captured moments of the everyday coloured with a palette of muted jewel colours. presents masked portraits which contain an enigmatic mystery at the heart of their sleek exteriors. Caught off guard or stoically iconic these figures project their own dreams on the space behind their masks. recreates pages from The Argos catalogue but removes the commodities. Liberating the gardens from their furniture and consumerist trappings, the paintings comment on both anti-capitalism and the landscape genre. paints dreamy, dislocated landscapes, swirling with Van Gogh-esque brushstrokes and distorted colours. These unsettling views of nature conjure up disorientating visions of a world highlighted with fluorescent marker pen.